In the realm of marketing and advertising, there are generally three different categories: inbound marketing, outbound marketing, and integrated marketing solutions, which blend inbound and outbound. While outbound marketing focuses on going to the customers, inbound marketing is based on trying to attract customers and clients to the company. Instead of approaching potential clients through methods like direct mail, TV advertisements, cold-calling, telemarketing, or by posting flyers, inbound marketing uses methods to find and attract clients without directly advertising to them. 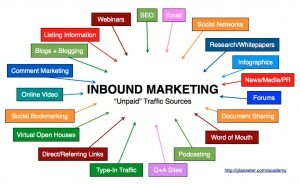 Why Inbound Instead of Outbound? When companies choose to implement inbound marketing strategies instead of outbound, they’re counting on the fact that proper research has been done so that the right people see the marketing content. Since inbound marketing’s goal is to attract customers rather than approach them, internet marketing services will produce different formats of content for companies, that the companies can post across different media platforms. Inbound marketing tactics include offering more information to the client than they are used to receiving, in hopes that the customer will want to learn even more and spend more time at a website. The time they spend on a website will theoretically lead to them becoming customers. Integrated marketing solutions blend outbound strategies with inbound, but if you’d rather work on only an inbound marketing strategy, there are several different formats you can use. Many companies use blogs to offer crucial information about their businesses, while others use things like videos, podcasts, newsletters, or SEO pages. All of these methods have the same goal: to attract traffic to a website, to convert visitors into customers, and to retain those customers. While the results are not immediate, they are typically longer lasting than using outbound marketing methods. Internet marketing services that specialise in inbound marketing techniques usually suggest to allot at least 6 months for the marketing strategy to take hold, and not to expect huge results right away. High quality digital printing equipment together with sophisticated software allows marketing pieces to be personalised and versioned according to a target’s needs or demographics – in essence mail merge on steroids!